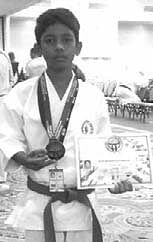 Jyoti Ranjan Nayak (13) of Kaunriapal village of the district won gold in international Karate championship under the banner of World Championships Orlando 2012. Organised by World Kickboxing and Karate Association, it was held at Orlando, Florida from September 22 to 28. Jyoti, a Class VIII student of Times Scholar Gurukul in Bhubaneswar, had played in junior team (13-17) Karate Kumite-45 kg and defeated Brazilian candidate in the sixth round to win gold. Before that he had defeated five candidates from Italy, Germany, England, Scotland and Ireland in the tournament. There were a total of six participants from India. Talking to this paper, his parents Rudra Narayan Nayak and Jashobati Kisan are happy with their son’s performance.